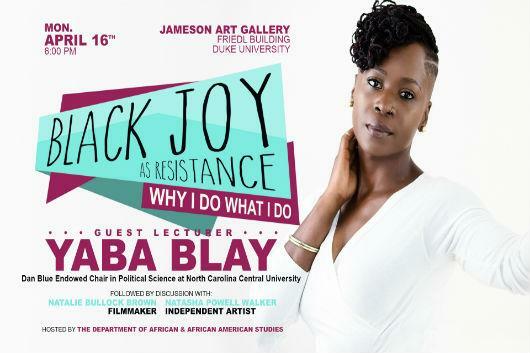 Dr. Yaba Blay, author of, (1)ne Drop: Shifting the Lens on Race, will discuss her work, including #PrettyPeriod and Professional Black Girl and how she uses Black joy as a methodology/paradigm for resistance. She will be joined by filmmaker Natalie Bullock Brown and independent artist Natasha Powell Walker, aka Edith Grey. Blay is the Dan Blue Endowed Chair in Political Science at North Carolina Central University. A professor and ethnographer, her scholarship centers on Black racial identity, Black aesthetic practices, and Black beauty, with particular attention given to hair and skin color politics. Named to The Root 100, an annual list of top Black influencers, Blay is one of today's leading voices on colorism and global skin color politics. Her commentary has been featured on CNN, BET, MSNBC, NPR, The New York Times, Ebony Magazine, The Philadelphia Inquirer, The Root, Huffington Post Live, Colorlines, and elsewhere. Applauded by O, The Oprah Magazine for her social media activism, Blay is the creator and producer of a number of online campaigns including #PrettyPeriod - a visual celebration of dark-skinned Black beauty - and #ProfessionalBlackGirl - a web series and online community celebrating everyday, around-the-way Black Girl Magic.